In 2010, Golden was selected as a “Bicycle Friendly Community” by the League of American Cyclists and awarded the bronze award for its efforts to improve infrastructure for bicyclists following the 2008 Bike Task Force Recommendations. In 2014, Golden’s efforts in implementing a “complete streets” policy were again rewarded by the League of American Cyclists, but this time with a silver award designation. Among the efforts earning this bump in status are added bike lanes on roads and additional bike/pedestrian bridges connecting neighborhoods to a major transit center. 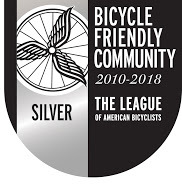 The Silver Bicycle Friendly Community Award puts Golden in an elite group of just 326 other cities in the country who are transforming their communities. Please download the latest Golden Bike Map to find bike routes, lanes, and shared use trails throughout town. The Golden Bike Library is a bike share system where visitors, residents, local employees and students can “check-out” a bike for a limited time for local use. The program runs from April through October and provides adult and children’s bikes through a check-out system located in the Visitor Center. Golden’s Bike Library is stocked with Jamis bikes —24-speed Explorer 2 and the Laser 20, a lightweight and durable aluminum model with a coaster brake and a rear V-brake ideal for small children. Snag a bike for local trips, employment meetings and recreation, or to link to public transportation. Kids’ Bike Rodeo, hosted by Bicycle Colorado every late spring/early summer. Bike to Work Day breakfast station, hosted by the City in June. Please check the city calendar for events, or contact Nick Eagleson in the Planning Division at 303-384-8096 for details. See our Bicycle Safety page for more tips and information. City staff, in partnership with Mitchell and Shelton Elementary School faculty and parent volunteers, were recipients of a Non-Infrastructure Safe Routes to Schools Grant (SRTS) for the 2016-2017 and 2017-2018 school years! 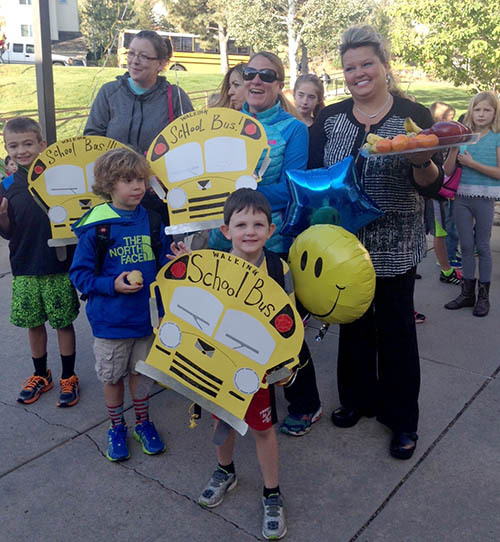 The education program proposed in the grant was selected by the SRTS Advisory Committee and unanimously approved by the Colorado Department of Transportation (CDOT) Commission on April 21, 2016. 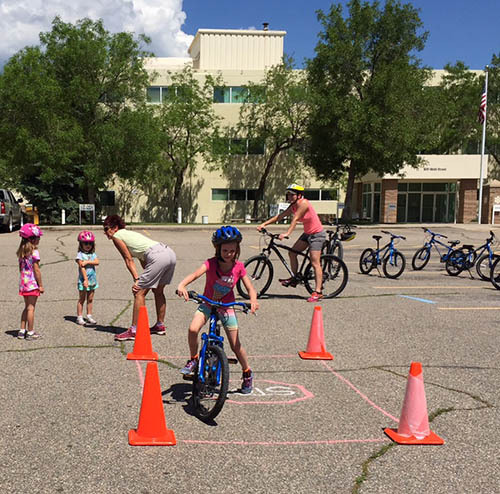 The City of Golden partnered with Bicycle Colorado (BC) to lead a non-infrastructure education and encouragement program through Safe Routes to Schools. Outcomes of the program included safety education during PE class, parent workshops, safe route to school maps for each school, bike rodeos, and drop off zones/walking buses for those living over a mile from school. Bicycle Colorado has worked with several SRTS grant awardees through the years to conduct sustainable education and encouragement programs. Bicycle Colorado staff are also working closely with PE teachers at each school to “train the trainer” on a pedestrian/bicycle safety curriculum that would be incorporated into the school curriculum at the completion of grant funding. The final step of the grant program will include signage identifying safe routes for kids to take to school along certain streets and trails. At the beginning of the program, a survey was taken to determine a baseline number of students who regularly walk or bike to school. The overall goal of the two-year grant program is to increase this number. Surveys will be taken again at the end of 2018. For more information, contact Amber Wesner, City Planner, at awesner@cityofgolden.net. City Council adopted a policy to address the needs of cyclists, pedestrians, and transit riders, as well as motor vehicles, when constructing or reconstructing major roads. 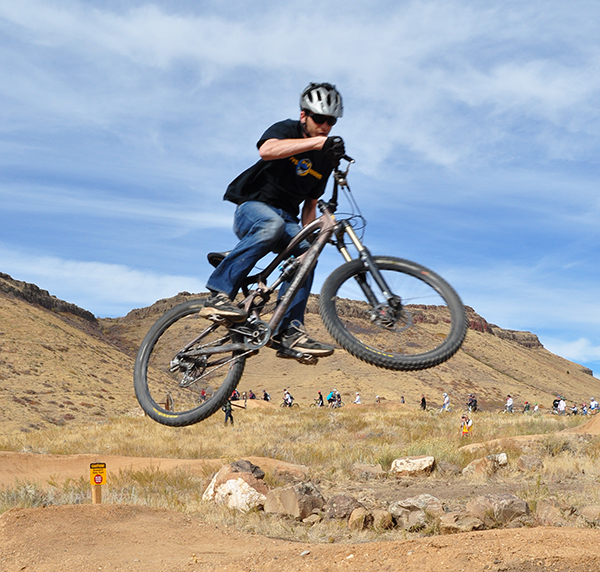 Tony Grampsas Park has the first purpose-built, mountain-bike-only trails in Golden, updated in spring 2015. Ride options include a downhill flow trail, bi-directional access trail, skills area, and beginner pump track. The gravity-fed flow park features rollers, berm turns, and table-top jumps that are suitable for beginners, and also offers options for advanced riders to launch their bikes. The Bike Park is volunteer built and maintained, and they ask that riders not ride when it’s muddy, or brake hard on the berms. For more information and to view a map, visit the Golden Bike Park page. The shared use path along Hwy 6 is now complete from 19th Street to Clear Creek where there has been a gap in the trail system. A new bike lane and wider sidewalks along Jackson Street from 14th Street to 24th Street now connects the downtown area to Golden High School. Cyclists and pedestrians are now able to get from Golden to the C470 trail system on a shared use path that begins at Golden Heights Park. The BNSF railway improved the R.R. crossing at 44th and Salvia. This was identified by Golden’s Bicycle Task Force in 2008 as a high priority fix, so this is very good news for local cyclists. The crossing point was subsequently leveled out to make the transition smooth for cyclists crossing. New to mountain biking? Join us for organized rides designed to introduce entry level riders to the sport of Mountain Biking. Learn trail etiquette, outdoor preparedness, riding skills and have fun! COMBA also hosts all-levels, women-only mountain bike rides throughout the summer. Rides meet at 5:45 p.m., ready to ride at 6 p.m. Check the COMBA web site for more meeting place and time, and to register for one of their organized rides.